'Fireball' devastates London underground train, say witnesses. At least 22 injured. Police investigating incident as terror attack. An explosion has been reported on a District Line train of the London underground system at Parsons Green in a suspected terror bombing in southwest London Friday morning. Emergency response teams and security forces have been deployed to the scene. At least 22 people were treated for injuries related to the explosion. 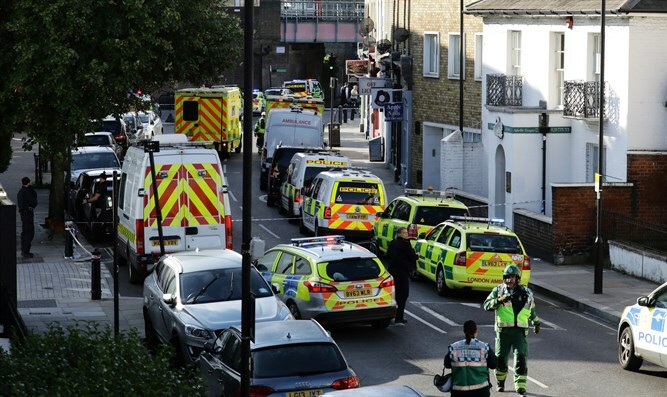 The local transportation authority, Transport for London, tweeted that the agency was “investigating an incident” at Parsons Green, but did not provide any details. Witnesses said that the explosion left “quite a few people injured”, and that there was an “extremely heavy police presence” at the scene, The Independent reported. Some described the explosion as a “fireball” blasting through the train, leaving a number of passengers with facial injuries, the Daily Mail reported. As those onboard the train rushed to escape, several passengers were thrown to the floor and trampled, The Telegraph reported. “There was panic as people rushed from the train, hearing what appeared to be an explosion," the BBC’s Riz Lateef reported. Images of a flaming bucket found on the train with wires hanging out have been circulated on social media, though police have yet to confirm whether the explosion was caused by a bomb. According to a London Fire Brigade spokeswoman, the incident occurred just at around 8:21 a.m. local time. Police confirmed that the incident is being investigated as a terror attack. "Deputy Assistant Commissioner Neil Basu, the senior national coordinator for CT policing, has declared it a terrorist incident,” Scotland Yard announced in a statement.